Beth travels to and serves business and direct sales professionals across the US and Canada from her Pittsburgh, PA location. Home party plan and direct sales leadership seminars can be combined for a 3-hour, 6-hour or retreat weekend. These recommended workshop times are offered as a guide. Topics can be customized to fit your specific training needs or meeting theme. 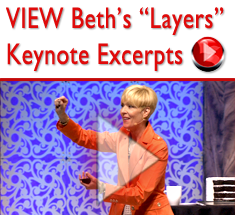 You can see Beth deliver excerpts from her “Layers” Keynote Address HERE. This 3-hour workshop focuses on how to build a solid foundation for your direct sales home party plan bookings and recruiting by building layers of relationships with your hostesses and customers. Highlights include how to help your hostess fill the room, how to break the ice with guests even before the party, how to stay connected with guests after the party, and how to overcome tele-phobia! It’s a power-packed workshop that is a must for all levels of consultants. – Discover proven strategies for excellent customer service that lead to consistency. 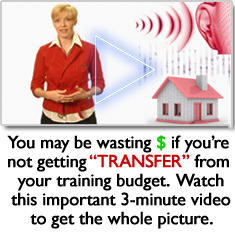 – Learn a winning system for hostess coaching. – Cure the “love-’em-and-leave-’em” syndrome permanently. – Discover sure-fire tips to eliminate tele-phobia! 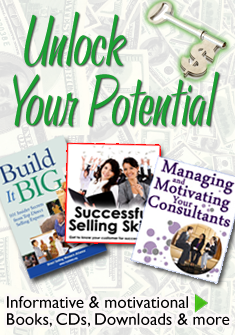 – Learn booking and recruiting tips to build your career. – Discover a 10-step daily plan for relationship building that will change your business. This 3-hour leadership workshop is perfect for all leaders who want to encourage and equip their future leaders to take the next step into leadership. This is ideal for laying a strong leadership foundation for new leaders on your team. – Learn how to establish a firm foundation in your personal business. – Build your team with the 4 expectations that lead to success – the #1 key to long-term success! – Discover eight tips for identifying future leaders. 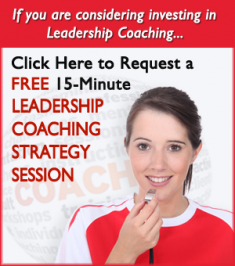 – Learn how to develop and coach your future leaders. – Discover the five keys to measuring your effectiveness as a leader. This 3-hour workshop focuses on the direct sales skills needed for successful recruiting and team building. Highlights include understanding the benefits of recruiting, where to look for recruit leads, how to interview effectively for long-term success, and how to get a new direct sales recruit started with a firm foundation. – Understand the benefits of sponsoring and team building. – Identify where and how to find potential leads. – Develop a month full of leads. – Unlock how to increase retention – the 92% fact. – Learn how to interview a lead – the #1 key to success. – Develop follow-up skills that lead to a positive decision. – Overcome and solve the most common objections. – Discover how to get a new recruit started for immediate positive results. This 3-hour success workshop is for direct sales consultants who need to boost their selling skills. Highlights include understanding your guests so you can better sell to them, book them, and recruit them. – Understand the four host and guest personality styles and tailor your presentation to them. – Learn how and why hosts decide to book with you. – Learn how to handle booking and recruiting objections. – Establish effective follow-up for booking and recruiting. – Understand how and why guests buy. – Design a show presentation every guest will love and respond to! This 3-hour leadership workshop focuses on 10 key leadership lessons essential for executive-level direct sales leaders. Discover lessons on how to set your team up for success, how to survive obstacles, how to keep your team moving forward with results, how to support with coaching and how to increase retention on your team by 90%. – Learn how to set your team members up for success beginning on their first day. – Build your team by teaching them how to develop persistence when facing obstacles. – Discover the #1 key to increasing retention on your team. – Learn how to support your team with coaching techniques that get results. – Discover the 10 leadership lessons that executive-level leaders must know in order to produce highly effective Direct Sales leaders. This 3-hour leadership workshop will teach you about the 4 different generations (age groups) on your sales team as well as among your customers, and learn how each generation’s uniqueness greatly impact your business. Learn how to successfully communicate, lead, motivate, recruit those age groups whose needs are different from your own. Fresh, cutting-edge information that will make an immediate, significant difference for all leaders. – Discover the four generations (age groups) you meet at your shows and learn how to connect with each other, their way. – Learn appropriate phrases to successfully book and recruit each generation. – Learn what motivates each generation on your team in order to see results. – Discover the communication tools that work best with each generation. – Learn 12 booking steps to incorporate with each generation. – Discover 12 recruiting steps to incorporate with each generation. – Uncover the myths and magic of motivation. – Learn what you can and cannot motivate in others. – Discover the one key every Direct Sales leader to unlock motivation. – Learn how to build a strong sales team. – Discover the five performance styles on your sales team, and how to work effectively with each. – Learn the qualities every sales manager must possess. – Design measurement tools to effectively gauge the productivity of your sales team. This 3-hour workshop is perfect for all levels of direct sales party plan consultants who desire a more consistent business. Learn how to prepare daily for a productive business, how to step up to the plate in the 4 disciplines of direct sales – selling, booking, recruiting, serving. Discover how to measure and track your progress. Learn over 30 causes for slumps in your business, and discover over 30 cures to overcome slumps for a successful, winning, consistent business! A fun baseball theme – perfect for all groups, especially those who want to excel in their businesses. – Discover the four fundamentals every direct seller must master. – Learn the eight key areas to track and measure for success. – Uncover over 30 factors that contribute to business slumps. – Discover more than 30 ways to overcome business slumps. – Learn how to keep the joy in your business! 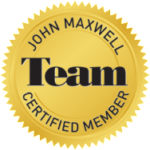 – Discover the #1 most important statistic for team success. This 3-hour workshop is filled with direct sales home party plan booking tips to keep your calendar full, recruiting tips to grow your business and a daily workout to keep your business focused. Great for all levels of consultants. – Discover how to keep your current hostesses and customers delighted. – Learn key exercises to keep your calendar filled. – Learn how to get new bookings from every home show. – Discover how to discover a recruit lead at every show. – Stretch your business into new areas for new businesses. – Learn a 10-step daily workout to keep your business in top shape! This 3-hour direct sales workshop will show how to double your income without doubling your hours. Learn goal setting, prioritizing and scheduling skills that work! Perfect for increasing retention of new recruits, as it targets and provides solutions for the #1 challenge of new party plan consultants. – Discover the #1 key to double your income without doubling your hours. – Learn how to write goals that get results. – Learn how to establish priorities that produce. – Discover the principle of balance and how it can impact your business. – Learn how to establish a schedule that actually works. – Learn 9 key steps to protect your schedule from distractions and time wasters. This 3-hour class will teach you about the 4 different generations (age groups) among your customers, and learn how each generation’s uniqueness greatly impact your business. Learn how to successfully communicate, lead, motivate, recruit those age groups whose needs are different from your own. Fresh, cutting-edge information that will make an immediate, significant difference for all consultants. These Christian-based direct sales seminars and workshops will take your direct sales team to the next level. Best of all you will learn how to grow your direct sales business God’s way. Fantastic workshops for a team retreat weekend! This 6-hour workshop focuses on how to balance your personal life God’s way. Highlights include establishing priorities, 7 steps to goal setting, handling interruptions, dealing with time wasters, establishing a practical schedule, and much more. This 6-hour Christian workshop focuses on how to step up to the plate with confidence in your Direct Sales business, how to hit it out of the park with bookings, how to identify the causes of slumps in your business and how to create powerful comebacks even in difficult times. Included are high-impact tracking strategies designed to help you measure the strengths and weaknesses of your business so you can make the needed spiritual adjustments for high productivity. This 6-hour workshop focuses on how to develop courage in challenging times in your direct sales business. Highlights include how to cowboy up when you would rather give up, how to defeat fears that sabotage your success, how to mend fences of difficult relationships, and how to persevere with purpose, all done God’s way. This 6-hour workshop will help you learn how to climb the ladder of success in your direct sales business God’s way. Highlights include a detailed look and biblical examples of seven steps of success – direction, preparation, action, communication, motivation, determination and celebration. This 6-hour workshop is a powerful focus on direct sales mentoring and coaching in your business and personal life. Learn why and how to mentor productively. Discover how mentoring is the difference maker in your business growth. Learn how to mentor God’s way! 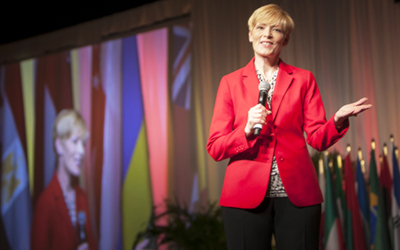 This 6-hour workshop focuses on understanding God’s plan for your direct sales career. Highlights include a biblical look at goal setting, communication, motivating and success in today’s workplace. This 6-hour workshop will help you plant, water, weed and harvest a bountiful crop of new customers, new hostesses and new recruit leads in your direct sales business. Learn how to network and expand your business God’s way! These topics are just a small sampling. Our Christian workshops/topics are customized to the event requested – women’s conference, leadership event, seasonal event, etc.. This 1 to 6-hour workshop focuses on how to balance your business and personal life God’s way. Highlights include establishing priorities, 7 steps to goal setting, handling interruptions, dealing with time wasters, establishing a practical schedule, and much more all with a biblical perspective. A 3-hour workshop focusing on how women can become godly leaders with compassion and courage, and do so God’s way. A 6-hour workshop focusing on building leaders by learning from the life of Nehemiah, with consistency, commitment, and character. This is a terrifically popular workshop for every member of your church or team. A 1 or 2-hour workshop focusing on developing a mentoring relationship for women.